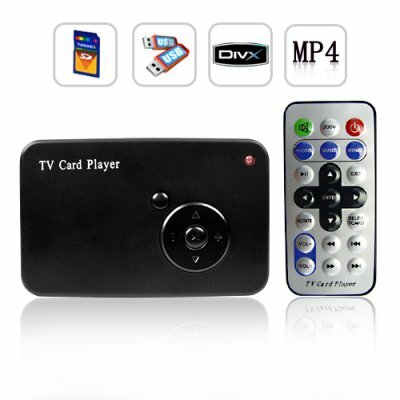 Successfully Added TV Card Player - 17 In 1 Memory Card Reader + USB HOST to your Shopping Cart. If you are an eBay reseller or drop shipper then this item will make you rich. Click "Add to Cart" now and we'll express ship you a sample to see for yourself the amazing performance this versatile high tech gadget has to offer. The CVASQ-013 is brought to you at a factory direct wholesale price, directly from the leaders in consumer electronic gadgets, Chinavasion. Handy and simple device that everyone should probably have. So far I've gotten it to play MPEG-1 (.mpg) and MPEG-4 divx/xvid (.avi) media. The video and audio quality are excellent. Content starts playing automatically when media is detected, which is fine but would be nice if optional. It works like a dream. I plugged it in and it played beautifully. Thanks for a great product. This is a great device. i can throw it in my pocket and take it to a friend's house. Great price for what it does. i can plug my 50gig hard drive and watch movies for weeks. VERY CLEAR CRISP VIDEO AND PICS .I PUT A 2 GIG MOVIE ON A THUMB DRIVE AND WATCHED IT ON TV.WITHOUT HAVING TO BURN THE DISK I DEFINITLY RECOMMEND. Works perfect and is very easy to use. Because it's very smal, you can easely take it with on a holiday or to friends. Een perfect apparaat voor je vakanties naar bv een bungalowpark of appartementencomplex, je hoeft geen dvd-speler meer mee te slepen.